"I'm arrested for armed kidnapping and I love knitting." Every Thursday around dusk, a group of men, hardened criminals sentenced for a variety of violent crimes and incarcerated at the Pre-Release Unit in Jessup, Md., can be found with knitting needles in hand and balls of yarn in their laps. 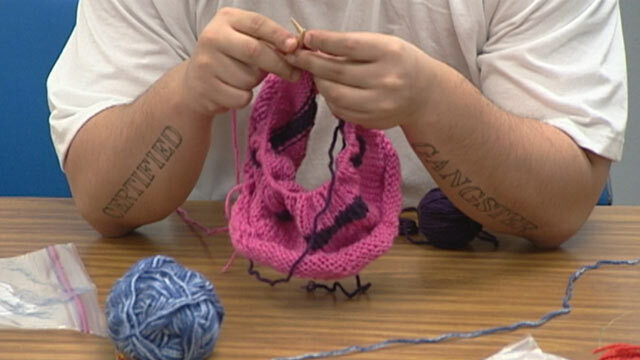 "I'm in for attempted murder and I'm knitting a small hat for a kid," one inmate said. Lynn Zwerling and Sheila Rovelstad started the "Knitting Behind Bars" program at Jessup two years ago. In that time, they and their all-volunteer group have taught more than 100 prisoners to knit, while dozens more remain on the waiting list. "For a man to have picked up knitting needles … to respond to being taught to knit, they've already shown themselves to be open people, people who want more," Zwerling said. One inmate said he enjoyed knitting because it gave him something else to focus beyond the barbed wire fences and watchman towers. "I feel calm," he said. "It gives you a peace of mind. It can definitely do that, give you peace of mind. It can take you away from prison." Zwerling and Rovelstad call it "finding the Zen." Another inmate compared it to hanging out at a coffee house, saying it gave him relief from penitentiary life. "It's like I'm at Starbucks, without the coffee, just chillin', enjoying the day," he said. "I'm doing something constructive. I could be doing a lot worse, to be honest with you. I could be running amok, being a pain in the behind. But I choose to come in here in relax." Since "Knitting Behind Bars" was introduced, Jessup's facility administrator Michele Jones said she has seen a difference in the men's behavior. "They have different affiliations, maybe someone's a Muslim, maybe someone's a white supremacist, they leave all of their differences at the door, and they sit together and they help one another," she said. But the ladies still remember the Department of Corrections initial response to their program. "'They don't want to knit. What makes you think men want to knit?' And I said, 'Oh they want to knit. They just don't know they want to knit,'" Zwerling said. Now some of the inmates have even skipped dinner to make it to knitting class. Zwerling and Rovelstad give each prisoner in the class a five-minute lesson -- they swear they can teach anyone. The prisoners' first project was knitting "Comfort Dolls," which were then given to children removed from their homes because of domestic issues. Now the men are working on hats for students at inner city schools. "You know, we did a lot of wrong in society and I guess this is a way of giving back," an inmate said. While critics of the program might say these prisoners should be doing hard time, Zwerling and Rovelstad say they have seen the inmates change for the better and they think it's important to give them something beneficial for the long term. "These guys are getting out," Rovelstad said. "They can't go one day from doing hard time to the next day being on the street. They have to make a transition somehow. It's what we can offer them." +Convicted Killers Live Life of Leisure?